If you are following me on Facebook, you might have learned about the foods I’m cutting out of my diet for 90 days. Some see this as an exclusion list but for every food I can’t eat, I see dozens that I can still enjoy. I don’t take issue with a 90 day cleanse because I understand that food is fuel (as well as being an expression of love and friendship), and what goes in my body impacts my body. Three months of super-clean eating, avoiding the foods that my body needs a break from seems no more difficult than living Whole30 last year. Take a look at our menu for the week and you tell me, am I suffering? Yup, that menu has a whole lot of lamb on it. I’ve been nibbling on lamb for breakfast, lunch and dinner recently. Lamb shanks are meaty and delicious and so easy to prepare. 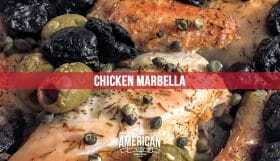 The meat is tender and succulent, the bones are perfect for making broth, and the braising liquid and makes a perfect stock. 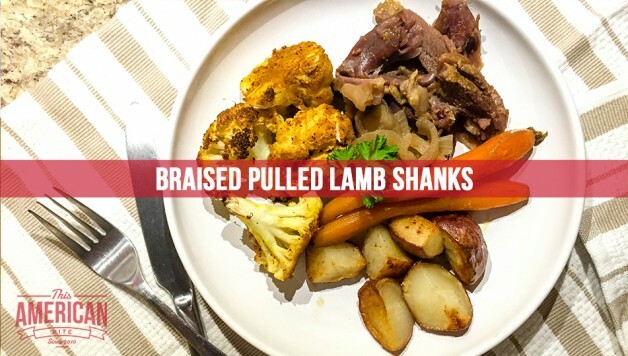 The KOL Foods lamb shanks are simply perfect and I like to keep some in the freezer so I have them for a romantic dinner or the perfect late night munchy-meal if hunger strikes at the end of a long day. 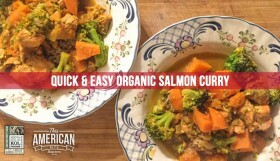 It’s really an honor to partner with KOL Foods to bring you this recipe. 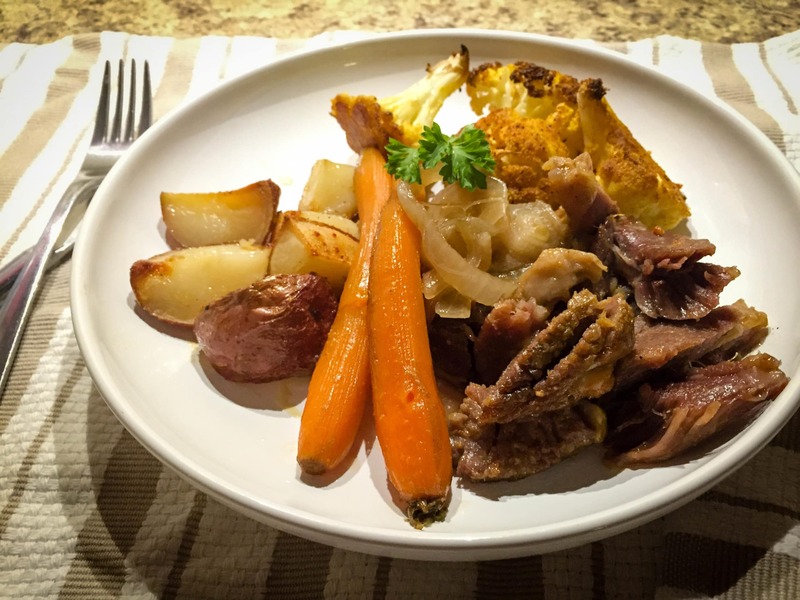 If you’ve seen my other KOL Foods recipes you will know that I am a big fan of their organic and pasture raised meat, poultry and fish. They are a company with a moral backbone, paying their farmers a livable wage and raising their animals in a hormone-free and healthy environment. Their focus of green energy, clean and healthy eating is a beacon of light in the food industry. 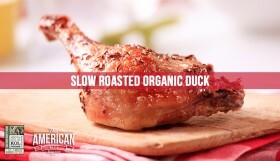 The meat from braised lamb shanks is perfect in tacos, delightful in a salad and simple delicious on it’s own. I had originally planned to share shredded lamb tacos with you but tacos are on the list of foods I can not eat right now, but this meat would be delicious in a crunchy corn taco or in a soft warm flour tortilla. Braising the lamb shanks with plenty of onions makes meat that is soft and succulent. The onions add a sweetness to the lamb stock when they cook over time. You can braise in red wine or stock. I used a quart of KOL Foods lamb stock that I had slow cooked overnight sweet potatoes and onions for an additional punch of natural sweetness. I find that lamb is so rich in flavor that you don’t need much in the way of seasoning, often salt and pepper will suffice, but I’m not eating black pepper at the moment. I seasoned with salt, paprika, white pepper and garlic powder. 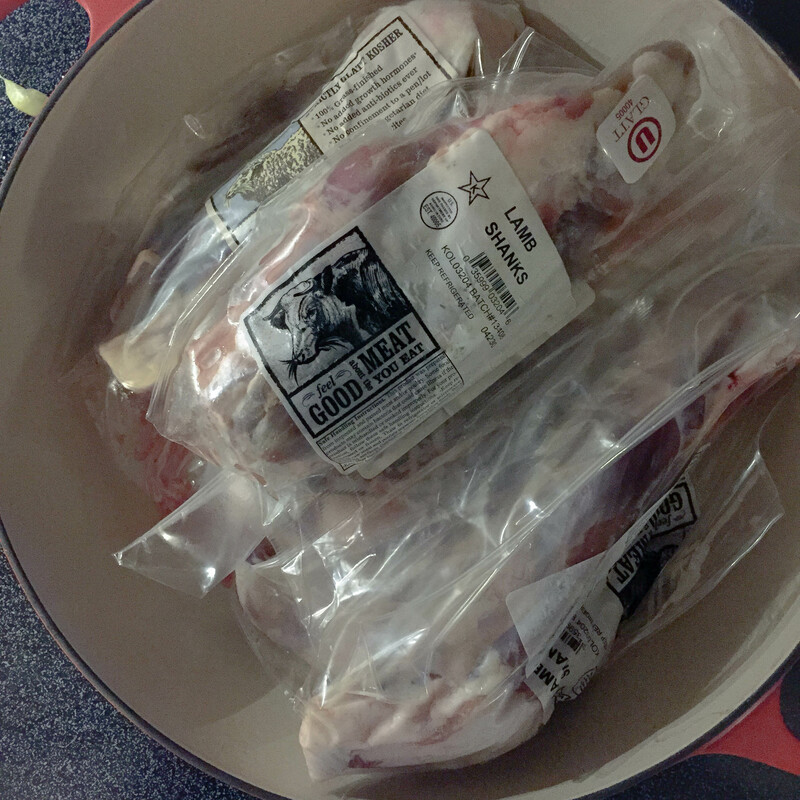 Using a tablespoon each of paprika and garlic, and half a tablespoon each of salt and white pepper, I had a generous amount of rub to cover six lamb shanks. 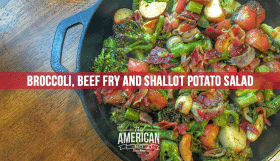 This is the perfect set-it-and-forget-it meal which means you have plenty of time to make side dishes. 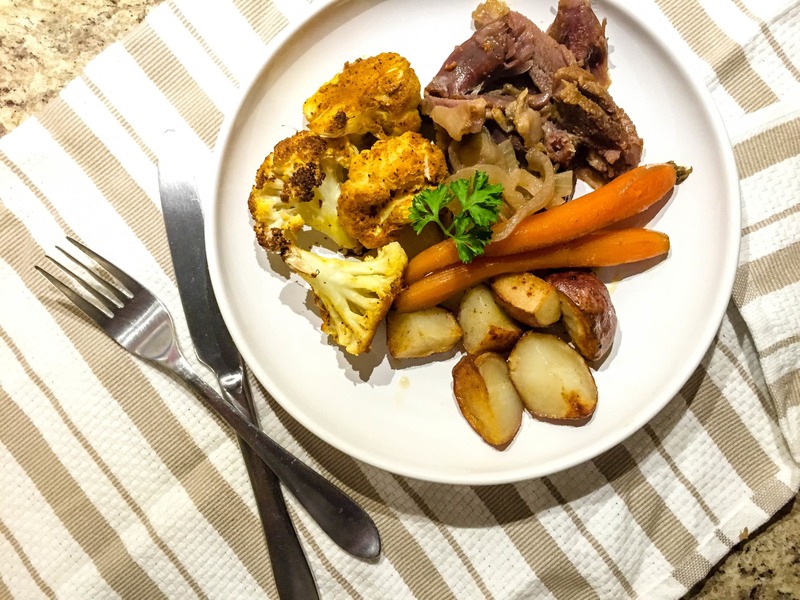 Popcorn cauliflower, roast potatoes, spinach salad or sweet potato fries all make perfect accompaniment to this dish. I roasted potatoes using chicken fat skimmed from a batch of bone broth I had made, rather than olive oil and seasoned them with garlic powder, onion powder and red chili flakes. I also used the leftover lamb spice mix on my popcorn cauliflower. 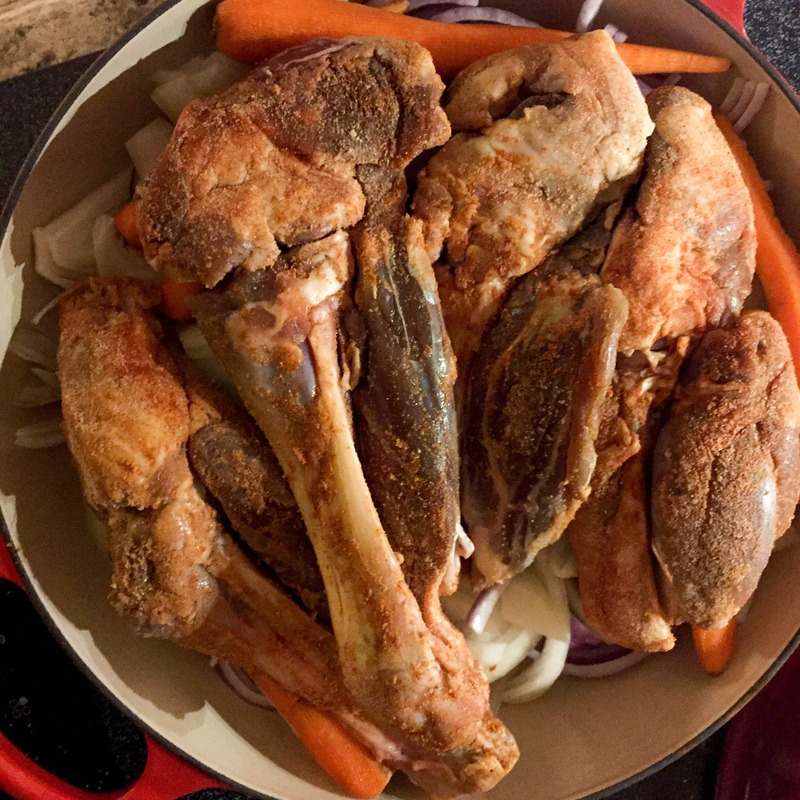 I’ve shared a brief history of braising, and the benefits of this cooking method alongside my Google-inspired Braised Chicken but the key is low and slow. I’d strongly recommend a minimum of three hours on a low heat but the lamb will be flavorful and edible after 90 minutes. Keep this going for four or five ours and the lamb will melt off the bone. The longer you cook the lamb, the more tender it will become and the easier it will be to shred. Although my wife and I ate this while we were binge-watching Friends on our new TV, this is a classy meal that I’d gladly serve to guests. Do me one favor too, please don’t throw out the braising liquid! If you used stock, it makes a wonderful base for an onion soup. If you used red wine, keep it and make biscuits and gravy for brunch on Sunday! 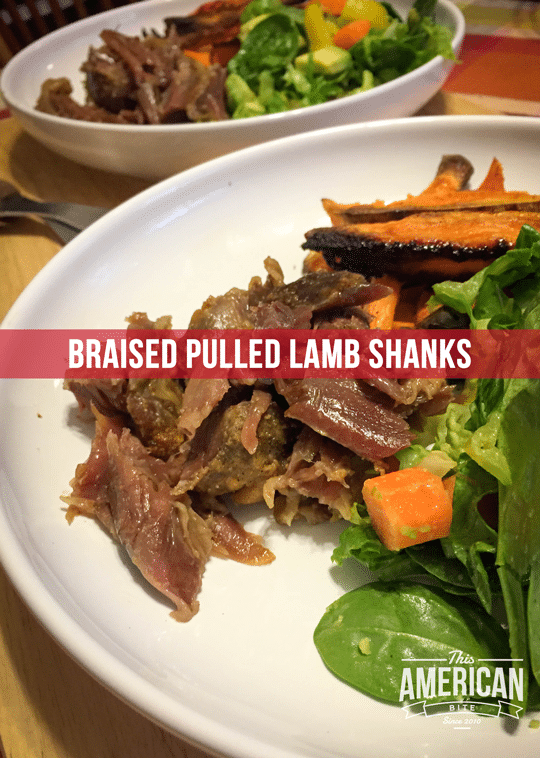 If you lamb is frozen, defrost it overnight in the fridge. 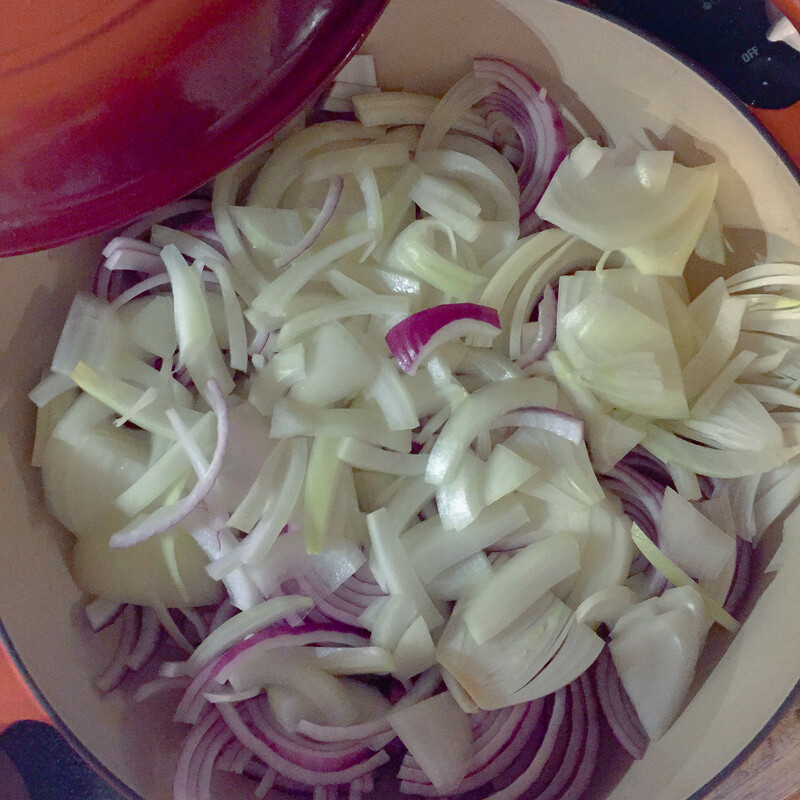 Slice the onions and put them in the bottom of a large braiser (this one is cheaper!). 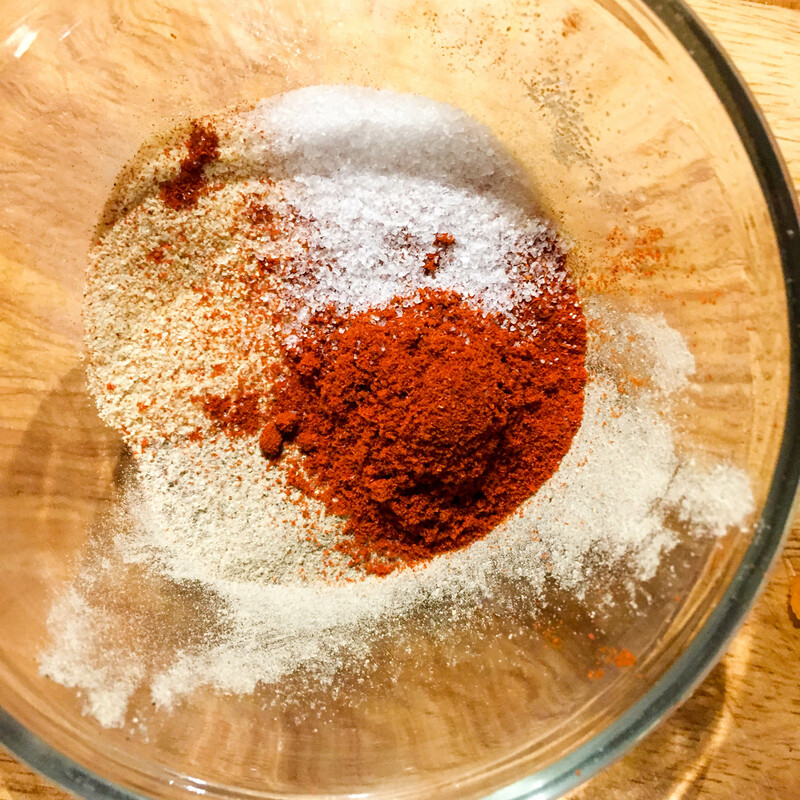 Mix the spices in a small bowl then sprinkle generously over the lamb. Put the lamb on top of the onions, peel the carrots and put them in the braiser too then add the stock. Cover and cook on a low heat for 2-4 hours.